Whether you’re a family enjoying the mountains or a group celebrating a recent wedding, you’ll want space for everyone. Our cabins offer not only multiple rooms for you to sleep in, but also spacious kitchens and living areas. Everyone can eat together, watch TV together or just enjoy their own quiet time. Plus, the number of rooms gives everyone their own choice of who they’re staying with, or if they want to stay in their own room. You will appreciate the extra space and privacy, too! Our cabins will most certainly leave an impression on you, either by just their size alone or by the look of the cabin itself. Not many people can say they’ve seen, let alone stayed in, a 12 bedroom cabin with two balconies on the second and third floor! Not only that, but these enormous cabins look right at home in the mountains. And each cabin has the same cabin feel as a smaller cabin, with things like wood floors and beautiful mountain views. Our cabins are spread throughout the area, so you’ve really got the pick of the crop when it comes to where you want to stay. If you’re looking for beautiful views of nature, all of our cabins have those, so what you’ll just need to narrow down where exactly you want to stay. Our large cabins in Pigeon Forge offer you the opportunity to be near all of the fun things you want to do while being only a short drive from Gatlinburg and the Great Smoky Mountains National Park. Why would you want to split your group up just because you couldn’t find a big enough cabin? Don’t compromise comfort for convenience when you decide to bring a big group to the mountains. 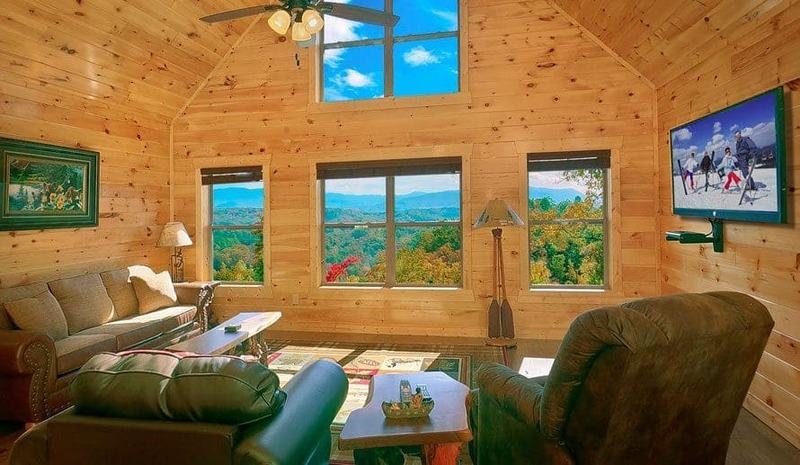 Like they say, go big or go home and we hope that you’ll go big with one of our large cabins in Pigeon Forge!